Yesterday at the Municipal Art Society Summit, three architecture firms — Foster + Partners, Skidmore, Owings & Merrill, and WXY architecture + urban design — unveiled proposals to remake public space in Midtown East, as the Bloomberg administration sets out to rezone the area for taller towers. How a pedestrianized Vanderbilt Avenue might look, according to Foster + Partners. The rezoning covers a large swath of Midtown, aiming to take advantage of new transit capacity as the Second Avenue Subway and the LIRR’s East Side Access project bring more people to the area. In an interesting twist, the administration wants developers to pitch in for pedestrian improvements as the area becomes a bigger destination for people. The encouraging part of the panel was that aside from the flashy rendering, the architects are generally looking down, not up, to improve the public realm in Midtown East – and they urged the city to do the same as the rezoning moves ahead. City Planning Commissioner Amanda Burden has already expressed interest in pedestrianizing Vanderbilt Avenue to accommodate the increased foot traffic that will accompany the completion of the East Side Access project. The architects followed Burden’s lead and went further, proposing to expand the pedestrian realm beyond Vanderbilt Avenue. A proposal for the Park Avenue viaduct from WXY architecture + urban design. The ideas presented yesterday would convert Vanderbilt Avenue, and to a lesser extent 42nd Street, to pedestrian-priority zones. Foster’s plan pays particular attention to pedestrian movement on the street and the already-crowded walkways and access points linking Grand Central, nearby sidewalks, and the subways. He noted that in Grand Central’s nearly 100 years, the number of people moving through has increased ten-fold but the size of the terminal has remained essentially the same. To eliminate congested choke points and better connect the terminal’s interior to its subway corridors and surrounding streets, Foster proposed converting some of the current retail spaces into circulation areas, especially along the 42nd Street side of the terminal. 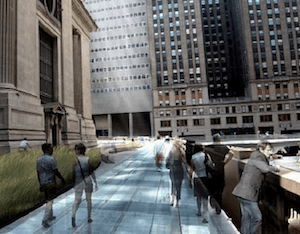 In plans from WXY and SOM, the Park Avenue viaduct, which wraps around Grand Central above street level, would become, at least in part, a space for pedestrians and bike riders. In its presentation, WXY drew direct inspiration from how the viaduct is used during Summer Streets. All three architects warned that good intentions and a rezoning aren’t enough to create a high-quality public realm. Zoning is a blunt tool, noted Weisz. “There should be a public realm and transportation plan,” she said, to lay out a vision that can’t be convey by a zoning text alone. 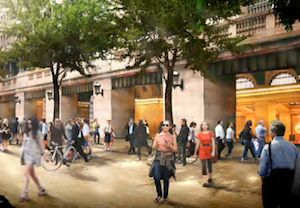 The Department of City Planning has indicated an interest in bold changes to the streets and public spaces around Grand Central, and three firms have laid out visions of what that might look like. As the rezoning progresses, we’ll see if the city’s plans live up to the potential. How about requiring the developers of these new towers to contribute to the southern extension of the Second Avenue Subway and underground ped space? The whole upper East Side was built to higher densities years ago in anticipation of the Second Avenue Subway. And all of Marine Park was built in the expectation the IRT would be extended. How about building the infrastructure first? For me, each summer streets experience is incredible, but one of my favorite moments each summer is biking up close up to the majesty of Grand Central Station. Every big train or bus station should have nice pedestrian space nearby because they are people magnets. Where you have thousands of people coming and going, there should be livable pedestrian spaces. It just makes sense! “There should be a public realm and transportation plan,” Is this where Toronto is headed? I hope so. When architects present their plans for a grand new signature building, they typically show it as part of the city skyline. What I would like to see is the bottom 10 feet next to the sidewalk. It’s that bottom 10 feet that pedestrians will see and interact with. Get the pedestrian space right, and then we can worry about what the tower looks like. Once it was off-limits to cars this afternoon, the block filled up with people pretty much instantaneously.